The Château d’Apigné, through its activities – the Hotel, the gastronomic Restaurant Les Tourelles, the catering has always been anxious to create, to exercise, to develop its activity in a spirit of sharing, defending a sense of different values. The values ​​we defend are social (diversity, training, listening, transmission), environmental (energy saving, waste reduction and valorization, short supply chains), cultural (jazz concert organization, electronic music …). employees of Château d’Apigné share this spirit of openness and respect. Here are some of the many recognitions that have been attributed to us. 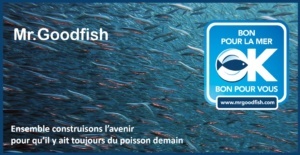 Mr.Goodfish: Since 2017, we are partners of the NGO Mr.Goodfish, a European program that aims to raise public and professional awareness about the sustainable consumption of seafood. It was initiated by three aquariums (Acquario di Genova en Italy, Aquarium Finisterrae in Spain and Nausicaá – National Center of the Sea, France) among the most important in Europe.